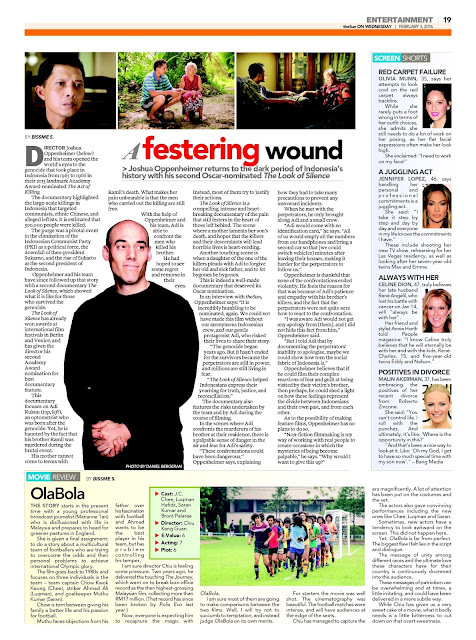 Director Joshua Oppenheimer and his team opened the world’s eyes to the genocide that took place in Indonesia from 1965 to 1966 in their 2013 landmark Academy Award-nominated The Act of Killing. The documentary highlighted the large-scale killings in Indonesia that targeted communists, ethnic Chinese, and alleged leftists. It is estimated that 500,000 people were killed. The purge was a pivotal event in the elimination of the Indonesian Communist Party (PKI) as a political force, the downfall of then-president Sukarno, and the rise of Suharto as the second president of Indonesia. Oppenheimer and his team have since followed up that story with a second documentary The Look of Silence, which showed what it is like for those who survived the genocide. The Look of Silence has already won awards at international film festivals in Berlin and Venice, and has given the director his second Academy Award nomination for best documentary feature. This documentary focuses on Adi Rukun an optometrist who was born after the genocide. Yet, he is haunted by the fact that his brother Ramli was murdered during the brutal event. His mother cannot come to terms with Ramli’s death. What makes her pain unbearable is that the men who carried out the killing are still free. With the help of Oppenheimer and his team, Adi is able to confront the men who killed his brother. He had hoped to see some regret and remorse in their eyes. Instead, most of them try to justify their actions. The Look of Silence is a compelling, intense and heartbreaking documentary of the pain that still festers in the heart of those left behind. The scene where a mother laments her son’s death, and hopes that the killers and their descendants will lead horrible lives is heart-rending. Another touching scene is when a daughter of the one of the killers pleads with Adi to forgive her old and sick father, and to let bygones be bygones. This is indeed a well-made documentary that deserved its Oscar nomination. In an interview with theSun, Oppenheimer says: “It is incredibly humbling to be nominated, again. We could not have made this film without our anonymous Indonesian crew, and our gentle protagonist Adi, who risked their lives to share their story. The documentary also features the risks undertaken by the team and by Adi during the course of filming. In the scenes where Adi confronts the murderers of his brother at their residence, there is a palpable sense of danger in the air and fear for Adi’s safety. “These confrontations could have been dangerous,” Oppenheimer says, explaining how they had to take many precautions to prevent any untoward incidents. When he met with the perpetrators, he only brought along Adi and a small crew. “Adi would come with no identification card,” he says. Oppenheimer is thankful that none of the confrontations ended violently. He feels the reason for that was because of Adi’s patience and empathy with his brother’s killers, and the fact that the perpetrators were not quite sure how to react to the confrontation. Oppenheimer believes that if he could film their complex reactions of fear and guilt at being visited by their victim’s brother, then perhaps, he could shed a light on how these feelings represent the divide between Indonesians and their own past, and from each other.